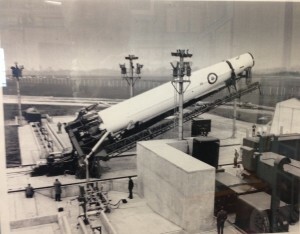 "To be, rather than seem"
The squadron was again reformed, as 77 Squadron SM, 1 September 1958 as one of twenty Strategic Missile squadrons associated with Project Emily. 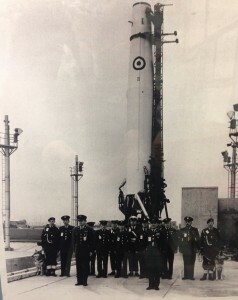 The squadron was equipped with three Thor intermediate–range ballistic missile (IRBM) with thermonuclear warheads and based at RAF Feltwell in Norfolk. In October 1962, during the Cuban Missile Crisis, the squadron was kept at full readiness, with the missiles aimed at strategic targets in the USSR. With the termination of the Thor Program in Britain, the squadron was disbanded on 10 July 1963. RAF Feltwell: American and British officers and security staff. Please consider joining and/or donating to the Association. As a voluntary group we are entirely dependent on donations and membership. We welcome your interest. We welcome all who are interested in, or connected to the squadron, and who would like to keep in contact.